Here’s my latest experiment in combining the best features of Howler and DAZ Bryce. 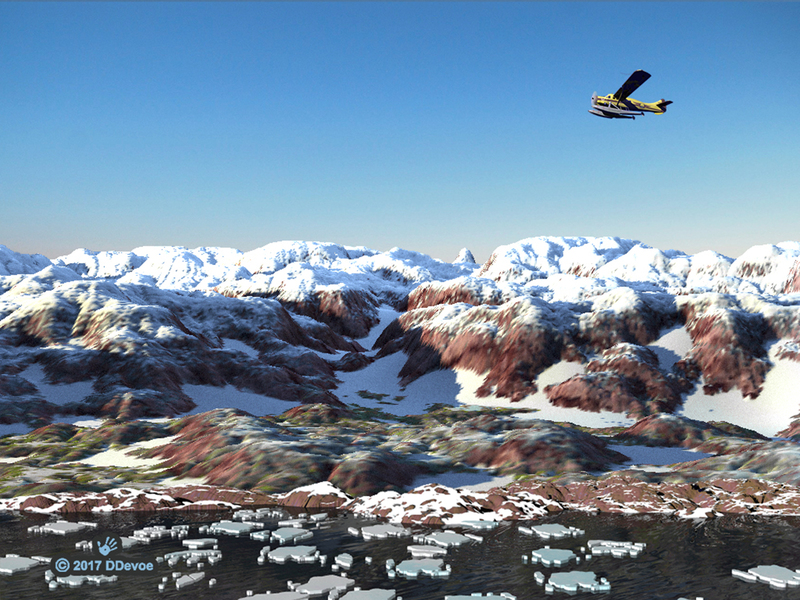 An arctic coastline, perhaps Greenland; with the familiar Flying Moose Aviation de Havilland Otter to indicate scale. 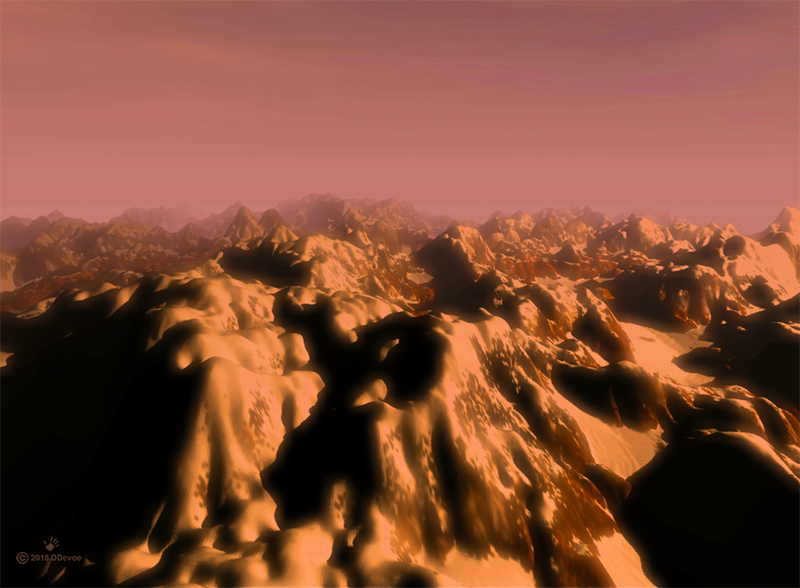 The mountains were rendered in Howler. I really like the degree of control one has in developing the texture, or image map, afforded by the use of an image editor such as Howler. Howler’s 3D Designer has two adjustable light sources which can be of different colors, typically orange and blue shades, resulting in very realistic lighting. The seaside rocks and water surface were rendered in Bryce. I was not 100 percent successful in integrating the two images; a bit of tinkering will be required the next time to improve the results. 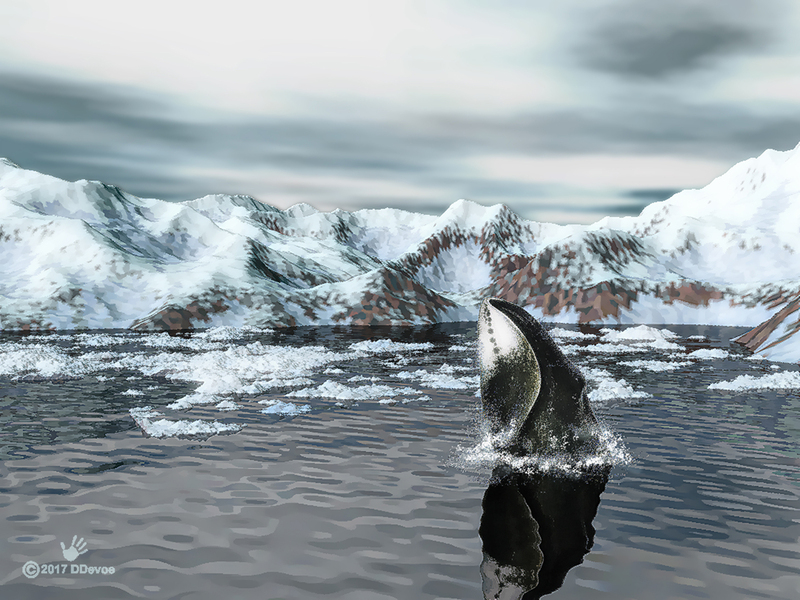 This image is a study or sorts; I want to make a similar scene depicting the houses typical of coastal Greenland with a whale breaching in the foreground, and improved floating ice. 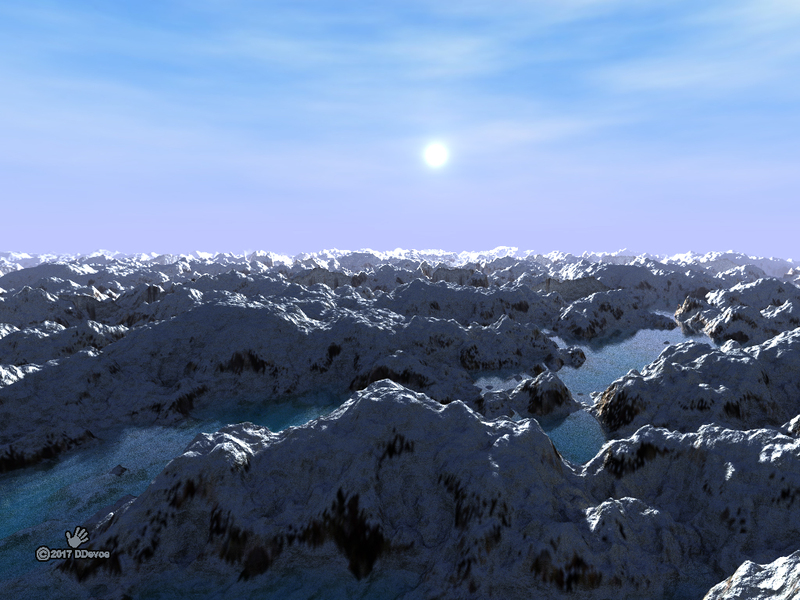 Another example of the amazing landscapes which you can make with Dogwaffle Howler. And an unknown something in the air over the mountains. Another new toy! Twisted Brush Tree Studio from Pixarra. More thanks to Philip Staiger at thebest3d.com for telling me about it. With Tree Studio you can quickly create 2D trees of several deciduous and conifer species. 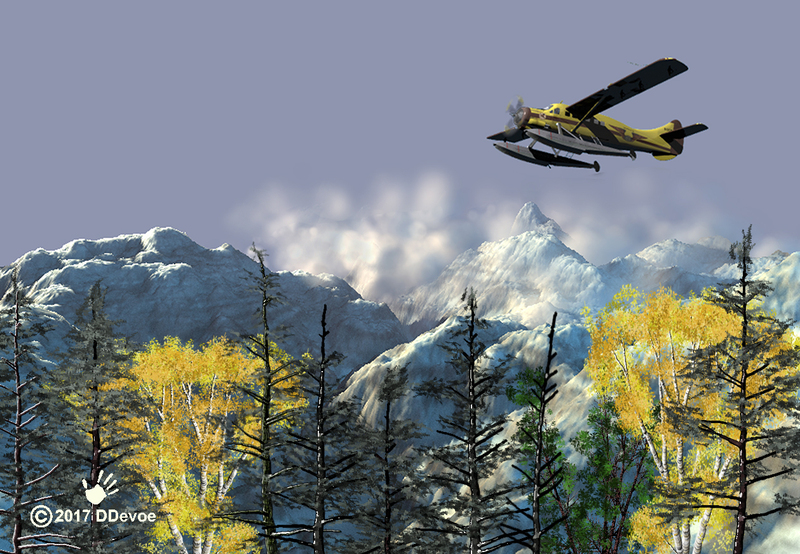 A few trees made in Tree Studio added to the recently-posted image of a de Havilland Otter flying over snow-covered mountains gives it an entirely different look and feel. With a bit of work you would have a very nice forest at feet of the mountains. Tree Studio allows you to adjust the colors of the leaves as I have done here so that the birch trees can be in their autumn colors. For added realism a few of the png tree images generated by Tree Studio have been warped with another application. Here is a screen shot of Tree Studio. The leaf color had been changed from the standard green to yellow. Tree Studios works with layers. A layer for the background, a layer for ground cover if, a layer for the trunk, a layer for the leaves. So that trees in the foreground will appear more realistic I suggest deleting the ground cover layer and adding another leaf layer behind the trunk as in this screen shot. 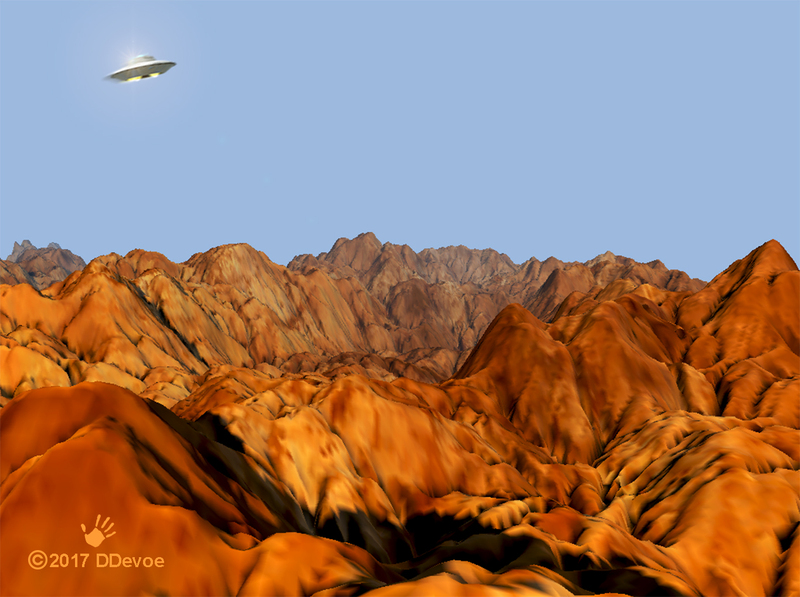 Further exploring Howler’s capabilities I rendered the very same landscape in Puppy Ray GPU as was shown in the last post, having been rendered in 3D Designer. Oh my! Taiga forest, I lived there. I use DAZ Bryce quite a bit to render landscapes. A useful feature is the capability to “stack” terrains. Stacked terrains offer a quick way of adding trees or rocks. Here’s a simple mountain terrain rendered in Bryce. 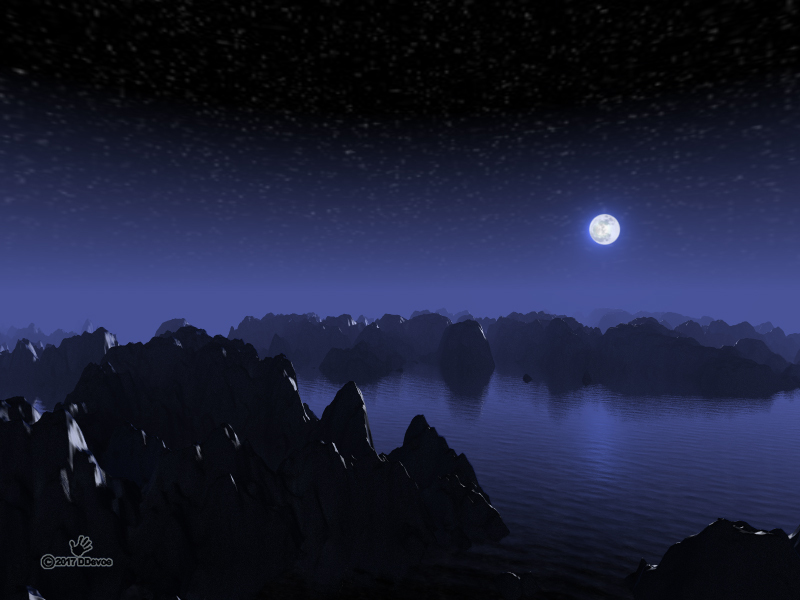 To add trees I duplicate the terrain then modify it in Bryce’s terrain editor. Generally I first add a bit of height and slope noise so the result will be more interesting. The terrain editor can add “spikes” to a terrain bump map. This can be done at several resolutions. In the screenshot of the terrain editor below you can see spikes added to a terrain map. The size and number of spikes generated vary with the resolution chosen. Here the resolution is very low so that you can see the spikes, they are not just dots. Simple dots would probably render as cylinders, not cones. You can see a rendered view at top right. When rendered in Bryce some of the cones are truncated. When the two terrains are rendered together the spikes of the “tree” terrain protrude through the original terrain. After selecting a texture for the “trees” there are a number of ways to further modify the terrain. By simply raising or lowering the tree terrain relative to the original you can vary the size and number of visible trees. Areas without trees and treelines can be made my editing the bump map. Such tree layers work best for mid-range or background terrains. With a bit of work you can a quite realistic image. I wondered if I could do something similar in Howler, so I rendered a terrain bump map with spikes, or trees, in 3d Designer; this is the result. The grass color was set as a reddish hue to resemble soil or conifer needle duff. Snow and rock were set as similar shades of green. As you can not work simultaneously with multiple bump maps in 3D Designer it would be necessary to edit the bump map to make areas without trees, such as on the peaks and steep, rocky slopes. A better texture map and some method of distorting the trees, so they do not render merely as smooth cones, would improve the results. Post processing might be required to distort them for added realism. I usually have to do the same thing for trees rendered this way in Bryce.